I'm also incapable of dressing myself in any presentable manner. How does a person even go about knowing how long capris should be? Or sleeves? CAN you wear a brown belt with a navy top? Are belts even okay anymore? Do you say "top" or is there some other super cool word for the clothing that goes on my...you know....top? And is it possible to wear the color plum without looking like a choir girl? Because my husband says no, and he's a boy. So if he's right on this one...I'm going to be wallowing in quite a pit of self pity over here. And how do you walk in shoes that are not sandals or running shoes? Just when I think I've got it figured out, I have to take a screaming child out of a crowded room at church and very nearly topple over while everyone in the entire world is staring at me. And wondering how I ever made it to be a grown-up girl without knowing how to actually walk. But then I surprise them with cookies and they are all like, "Oh my gosh! I love her! She is the coolest grown-up girl I've ever met in my entire life. We should be friends and make cookies every day of our lives until we're all grown old and can't make cookies anymore and no longer care about fashion and shoes and filing our nails because we're just glad we're not dead." Not to be all braggy or anything, but sometimes my cookies can totally be distracting like that. Want to be distracted? 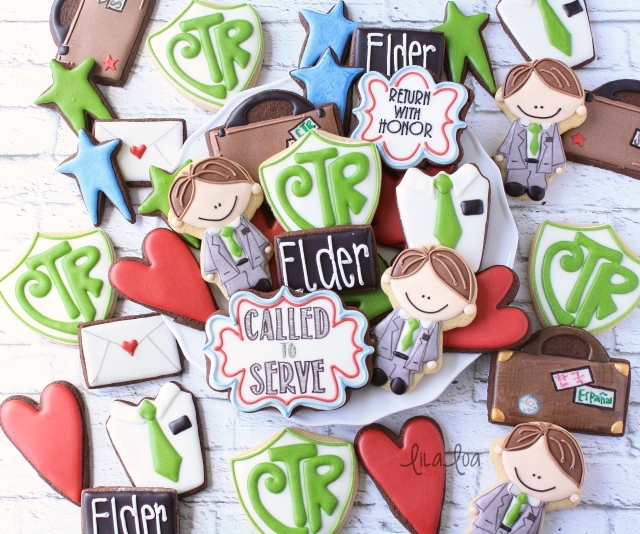 These cookies were for an LDS missionary. You could easily leave off the black name tag and make them for any formal event. Except pig wrestling. Because that's not really a formal event outside of Wyoming. 1. Outline and flood the entire cookie with white icing. Let the cookie dry overnight. 2. Pipe 2 white rectangles at the top of the cookie for the collar. 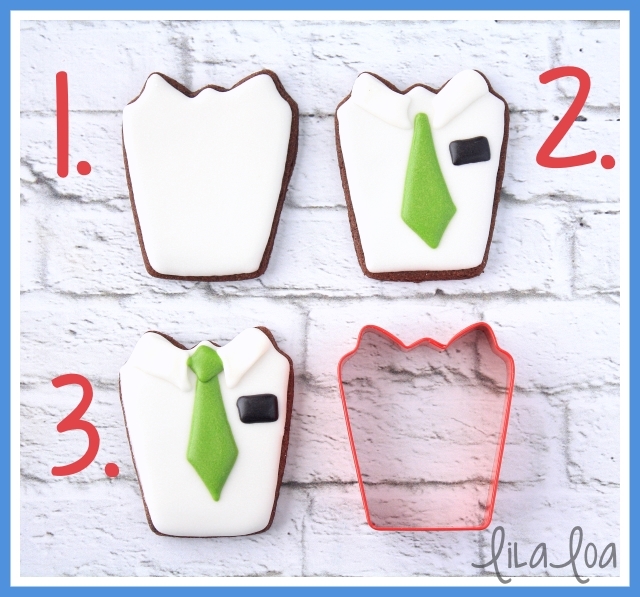 Grab some medium consistency green icing and a #2 tip and pipe an elongated diamond shape for the bottom of the tie. Pipe a small black rectangle with medium consistency black icing and a #2 tip. You could also just draw it on with a black food color marker. Let it dry for 20 minutes. 3. Pipe a diamond at the top of the tie for the tie knot. That's it! SUPER EASY. See? I wouldn't lie to you. Unless you ask about my kitchen floor. And in that case, it's totally clean. See the tutorial for the LITTLE MAN MISSIONARY cookies. 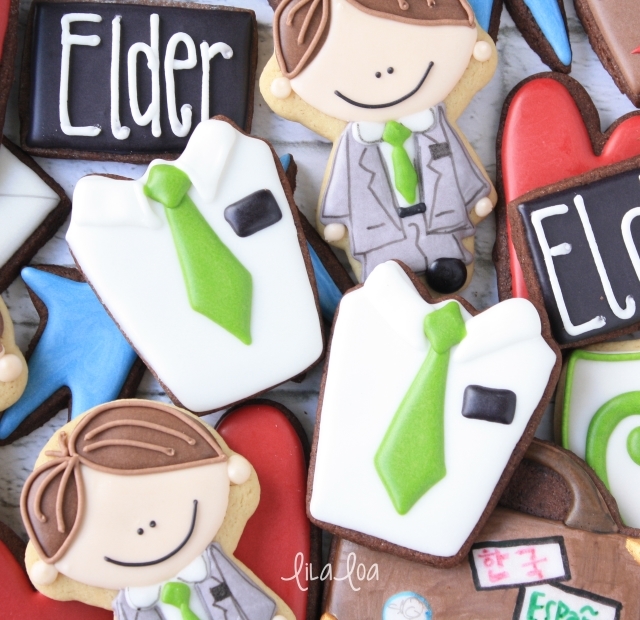 EASY LDS SISTER MISSIONARY COOKIES.